Microsoft appears to have ditched any plans for VR or mixed reality experiences on the current generation Xbox machines. A senior Microsoft marketing exec has signalled that there are currently no plans to do develop VR/MR experiences for Xbox, and that the platform is focussed upon entertainment for your living room TV. 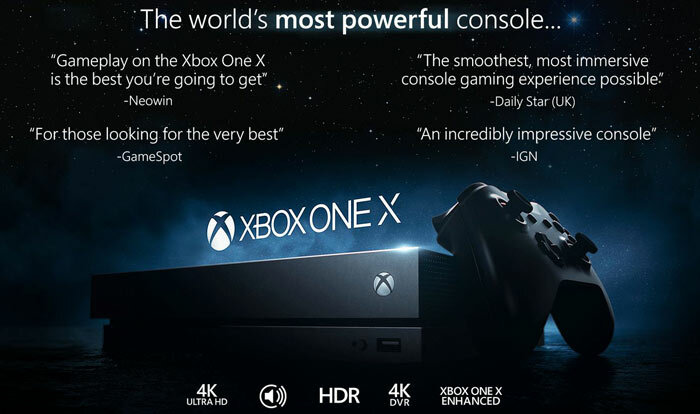 Back in 2016, Xbox chief Phil Spencer said that the upcoming Project Scorpio console, which materialised as the Xbox One X, would support "high-end VR" similar to the experiences achievable on Windows gaming PCs. As The Verge reports, the announcement, and the close partnership with Oculus in supporting Xbox controllers, led to speculation that the Scorpio would support the Rift HMD. A year ago there were still plans to "bring mixed reality content to the Xbox One family of devices, including Project Scorpio, in 2018," but that ambition has now fizzled. In a recent interview published on GamesInduistry.biz, Microsoft's chief marketing officer for gaming Mike Nichols put the lid on our expectations that there will be any VR or mixed reality content on the current gen Xbox consoles. Nichols admitted "We don't have any plans specific to Xbox consoles in virtual reality or mixed reality," before recommending the PC as "the best platform for more immersive VR and MR". Talking about the wider industry marketing exec said that AR is a good match for phones, before returning to the topic of Xbox One consoles which he said were primarily focussed upon "experiences you would play on your TV". Meanwhile, the rival Sony PlayStation 4 and its VR headset are doing moderately well with 2 million units sold in a little over a year, at the last count. This is not the first time Microsoft has significantly changed course on Xbox One. Ahead of launch it backtracked on unpopular DRM policies, and then it didn't take long to decide that Kinect unbundling would help them sell more consoles. In recent news there have been much more positive things for Microsoft Xbox, such as the growth of backwards compatibility on the platform (with enhanced older games too) and the support for modern display features such as HDR and FreeSync. I imagine the proclaimed support and then backing down on VR largely follows the same process as that for 3D screens around 5 years ago. On the pc side and playstation its constantly expanding…. I really don't think it is a fad. I'm not a huge VR fan as I have had issues with kit I have tried but that may well be me rather than the tech itself. And I certainly am a cynic regarding 3D, partly because of tech but partly, decent 3D material and I put the latter down to lack of belief by content producers that it actually adds much to most programs. However …. my view is that good VR could be hugely beneficial to the immersiveness of a good proportion of games and, done well, would be superb. I'm more inclined to suspect that the issue may be what's required to meet the “done well” criteria, and whether (current gen) XBox hardware is truly up to it. After all, PCs are a bit like the old Two Ronnies “ Four Candles” sketch - a never-ending upgrade, and upgradability cycle. The XBox One has faster hardware than the PS4,but the PS4 VR kit has additional processing built into it. Noted. It may be that distinction that's making the difference. Or it may not. It's just gut-feel on my part. IANAE(xpert).